In today’s all weather wicker outdoor patio furniture market, we the consumer could spend countless hours scouring the web searching for that set of furniture that gives us the most for our money. It can be very hard to purchase outdoor patio furniture without actually being able to touch or feel it. With that being said Open Air Lifestyles, LLC prides themselves on offering only true and genuine materials like Sunbrella fabric, Viro brand wicker and virgin aluminum, not faux materials that only fail in the short term. 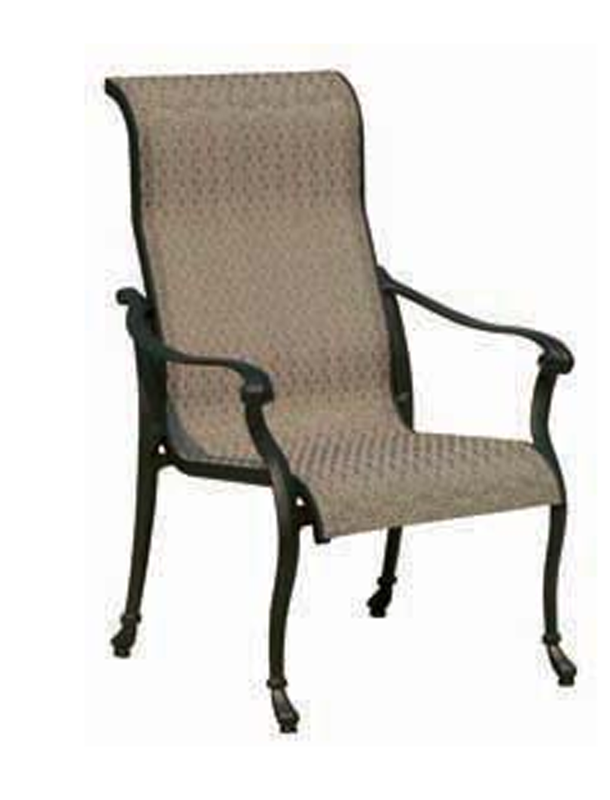 The Marchesa all weather wicker deep seating patio furniture collection from Open Air Lifestyles, LLC can satisfy your needs on a number of fronts. This collection allows you to configure your seating in several positions, which gives the consumer the ability to place the pieces of furniture in several locations throughout their outdoor living space. If placed together, the Marchesa collection can easily seat seven people (depending on configurations) comfortably which makes this collection highly desirable for families that spend time together inside or out. The most popular of configurations for the Marchesa collection boasts an extra-large sofa, a loveseat, two well-proportioned club chairs, a sizeable coffee table and end table that harness an eight mm thick smoked tempered glass. There are also various configurations available in the Marchesa collection which can be placed in just about any living space to suit your needs. The Marchesa all weather wicker deep seating patio furniture collection is offered in numerous layouts with prices ranging from $2000.00 to $4000.00 and all come equipped with a substantial warranty. The collection has multiple pieces to choose from ranging from ottomans, end tables, coffee tables, sofas, loveseats, and club chairs. Another nice feature the Marchesa collection has is that it comes fully welded. No annoying nuts and bolts to assemble or maintain by periodically tightening due to temperature fluctuations. Just remove the furniture from the packaging and its ready to enjoy. From a durability standpoint, the Marchesa collection receives a very high grade. 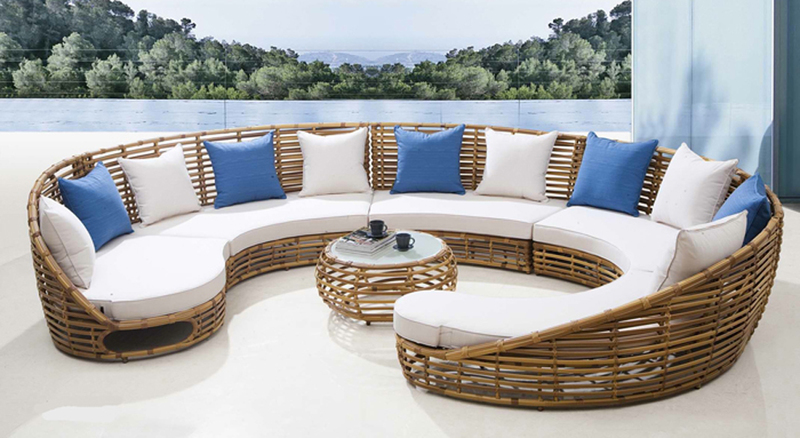 This wicker deep seating collection is hand woven using strands of Viro brand wicker that are double woven on every piece and being fully welded ensures ownership of this set for many years down the road. The Viro brand wicker color available on this particular collection comes in graphite (black). The Marchesa collection comes equipped with reticulated quick dry foam cushions encased in genuine true Sunbrella fabric, which can be unzipped and removed for cleaning purposes. Open Air Lifestyles, LLC is located in Michigan just outside of the Detroit metropolitan area, where they continue to work aggressively on new trending designs and using only genuine materials available on the market. They pride themselves on offering the best quality at an affordable price which in turn promises to please the consumer with high end furniture that will last a life time. You can inquire about their full line of products ranging from furniture covers, outdoor rugs, fire pits, umbrellas, deep seating sets, dining sets, chaise lounges, bar height sets, outdoor televisions and accessories to fulfill and enlighten your outdoor living space by calling toll free: 1-877-548-5697 24 hours a day/7 days a week EST. If you take a few minutes and browse the web, one thing becomes painfully obvious. 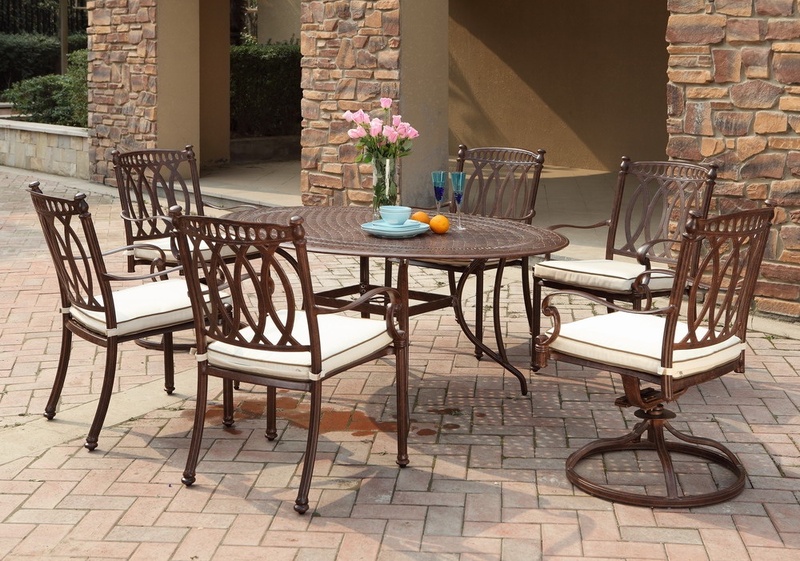 There are countless places to purchase cast aluminum patio furniture. This leads us as the consumer to the next dilemma. Where should I buy my new furniture from? Open Air Lifestyles, LLC answers this question with an exclamation point. With a variety of styles to choose from, Open Air Lifestyles, LLC can help you make your selection with confidence. Whether it’s deep seating, dining, lounging, umbrellas, or bar height set configurations Open Air Lifestyles, LLC gives you a number of options to help fill that outdoor space for years and years to come. If you are interested in purchasing cast aluminum patio furniture, value and quality should be first on your checklist when it comes decision time. Open Air Lifestyles, LLC believes in giving you the most “bang for your buck” and recognizes your hard earned dollar. Not only do they have stylish and unique furniture designs but, they carry a large line of durable long lasting cast aluminum products ranging from dining to deep seating. With Open Air Lifestyles, LLC’s in house design-team they continually look to produce strong fully welded furniture products that will be able withstand the harsh outdoor environments. One great attribute that they apply to all of their cast aluminum products is that they have a finished molded design on both front and back of all of their chairs, whereas most of the furniture manufacturers on the market do not. This leads to an unfinished (one dimensional) look when you look at the backs of most cast aluminum dining chairs. Additionally Open Air Lifestyles, LLC’s cast aluminum line is “fully welded”. This not only increases the longevity and durability of the consumer’s purchase but, offers a very substantial piece of furniture that the consumer will not have to fight with to assemble for two hours prior to being able to actually sit down and enjoy. KD or otherwise known as “Knock-Down” furniture are molded pieces of aluminum that have to be assembled with nuts, bolts, washers etc. This type of furniture design usually at some point in time, leads to a regular maintenance of tightening the hardware due to the temperature changes in the outdoor environment. All of their cast aluminum pieces are fully welded with the exception of their tables and motion pieces (i.e. swivel dining chairs, lounge backs). Each piece of cast aluminum furniture goes through an extensive five stage powder-coat process to efficiently protect the cast aluminum. This electrostatic process ensures a long lasting finish that prevents peeling or cracking under the harsh outdoor elements. They offer a choice of matte black, bronze or cinnamon colored finishes to choose from. Open Air Lifestyles, LLC is located in Michigan just outside of the Detroit metropolitan area, where they continually work on new trending designs and using only genuine materials on the market. They pride themselves on offering the best quality at an affordable price which in turn promises to please the consumer with high end furniture that will last a life time. You can inquire about their full product line at: www.openairlifestylesllc.com or call 1-877-548-5697 for more information. For commercial inquiries visit: www.outdoorcommercialpatiofurniture.com, there they have a full line of dining sets, deep seating sets, chaise lounges and bar height sets ranging from wicker to cast aluminum designed for the commercial environment. When it comes to outdoor living and stylish designs Open Air Lifestyles, LLC continually sets the benchmark for such a lifestyle year after year. Using only the highest quality materials and resources they enhance the patio furniture market with durable and long lasting designs. Not only does Open Air Lifestyles, LLC provide some of the most premiere furniture available on the market today but, they do it with impeccable customer service at an affordable price point. With that being said I would like to introduce the Taryn deep seating patio furniture collection. This particular collection comes standard with the five essential pieces which include two generously proportioned club chairs, one loveseat, one coffee table and one end table. So what’s new? Well Open Air Lifestyles, LLC took their most popular deep seating collection and made it even better. They added wider arms, heavier frames, double weaving and thicker cushions all using the finest materials like Sunbrella fabric, Viro Wicker and virgin aluminum. 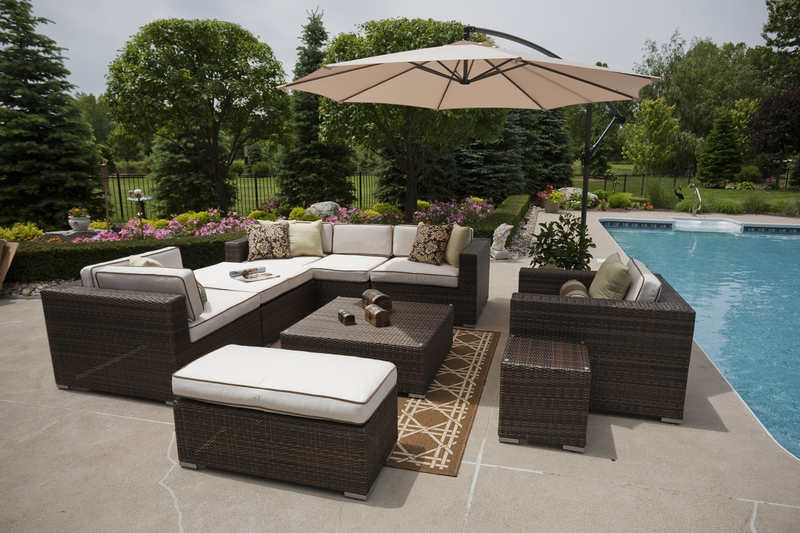 The use of Viro brand wicker wrapped around its extra strong aluminum frame makes this set even more popular this coming season, as if it wasn’t already before. Accompanied with five inch thick reticulated quick dry foam cushions housed in genuine Sunbrella fabric ensures the consumer that comfort and weathering will not be a concern. Open Air Lifestyles, LLC even went above and beyond the market standard of thickness on the glass that rests on top of the end table and coffee table. While most furniture manufactures in the US market use 3-4 mm thick glass Open Air is now using 8 mm thick glass, now that is substantial! This luxurious set can be configured a variety of ways, so having a dedicated space isn’t mandatory. The consumer also has the option of adding an additional sofa if need be to accompany a larger seating area. The best part of all of this is that Open Air Lifestyles, LLC offers this collection at astonishing prices ranging from $1400.00 to $4000.00 with a very substantial warranty. When it comes to quality, excellent customer service and price, Open Air Lifestyles, LLC prides them-selves on just that. 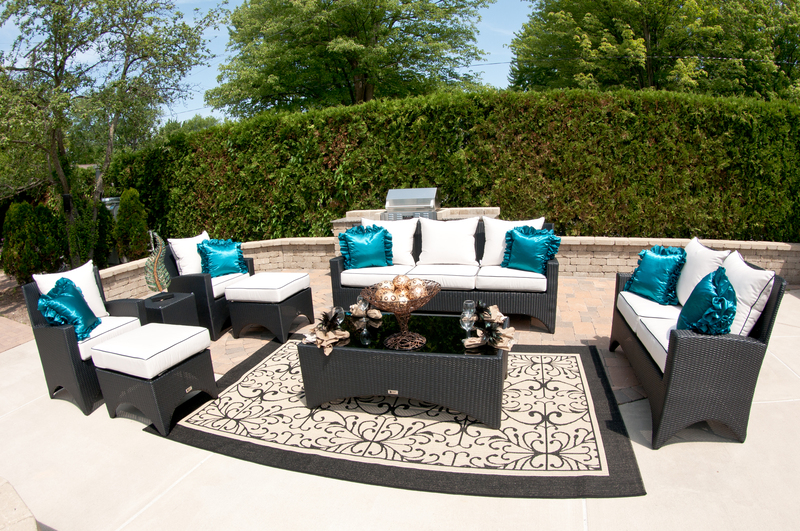 So if you are looking to furnish your outdoor living space, then Open Air Lifestyles, LLC is a great place to start. Open Air Lifestyles, LLC is one of the industries leaders when it comes to quality rattan al fresco patio furniture. They are introducing a substantial selection of exciting contemporary styles each season, and 2012 is no exception. When it comes to choosing all weather woven products, the company believes in working meticulously with its customers, to ensure satisfaction when it comes time to consume your hard earned money. Open Air Lifestyles, LLC provides a variety of styles and configurations for all types of living spaces and uses only the finest of resources on the market on behalf of all of their products. Whether its wicker deep seating or wicker dining, Open Air can accommodate your needs from start to finish. The company is furthermore proud to introduce a substantial quantity of coordinating pieces, which will complement nicely to whichever design of furniture the customer chooses. Certain customers are looking to fill a small terrace, with some daytime lounging and other customers are looking to enhance a significant area, which may possibly include a pool or considerable open-air dining area. Several of these spaces possibly will be covered such for instance a sunroom and a number of spaces could exist in the wide open fully exposed to all of nature’s elements. They have the capability to brighten up just about every outdoor area with stylish, long lasting durable products, all carrying an extensive warranty. Why Open Air Lifestyles, LLC you might ask? The answer is straightforward to come by as soon as you lay your eyes on the collections they supply to the marketplace crafted from some of the highest quality products existing today. They stand behind each and every article of furniture purchased and feel they can satisfy any and all consumers with time tested durable open-air spaces. Open Air additionally offers a commercial line of furniture intended for the large hotels, resorts and restaurants all through the United States. Open Air has proven it’s achievable to acquire luxury without breaking the bank. Open Air Lifestyles, LLC strongly believes in providing its customers with a quality experience when purchasing. This includes excellent interaction from the moment you’ve chosen your furniture to the moment you essentially sit down to take pleasure in what you have purchased, your satisfaction is priority number one. So, you say to yourself, “I’ve bought my furniture, picked out the style, and fitted it perfectly to my space”. How can I increase my furniture longevity? The answer is simple FURNITURE COVERS. Furniture covers come in a variety of shapes and sizes as well as a lot of different materials. As with their products they decided to use the finest material available when it comes to furniture covers, Weathermax. While most covers claim to be breathable, do not be fooled. Most covers out there in the market are either vinyl or vinyl coated polyester. Polyester is commonly used and is indeed breathable, however is not water resistant. They are breathable only if they build in vents which then allows dirt and dust in. 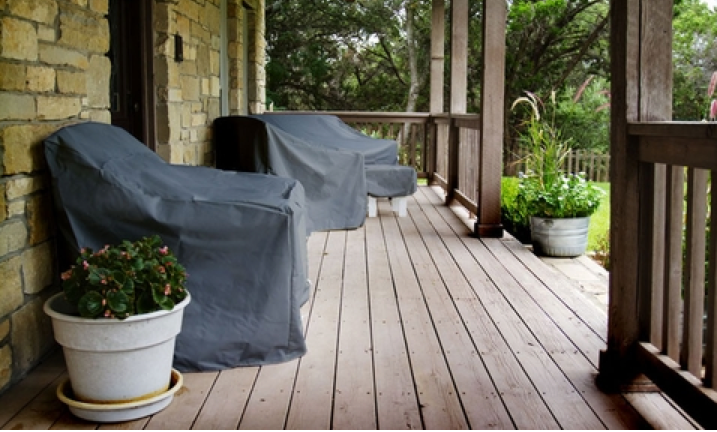 With a Weathermax cover, you can rest easy knowing your furniture is safe and dry. In the end they go the additional mile to ensure your enjoyment in support of many years to come. They believe with the aim of quality products and a quality buying experience it will result in a long term relationship among them the supplier and you the consumer. Great news from Open Air Lifestyles, we now carry our own patio furniture covers due to popular demand from our clientele. True to Open Air Lifestyles commitment to quality and style, we have spared no expense. Many covers claim to be “breathable” but are not water resistant because they are vinyl or vinyl coated polyester. Open Air Lifestyles is proud to announce a newly designed fabric called Weathermax, specifically designed to be breathable and water resistant without the use of vents and holes in the cover itself so no dirt or dust can get through. Cutting edge technology guaranteed to give your quality furniture exactly what it needs and deserves. Need a unique size for your outdoor patio furniture, have no fear, Open Air Lifestyles can custom make covers for your unique specifications for ANY set of outdoor furniture and also stock many unique size configurations. So whether your patio furniture set is from us or not, we will be able to accommodate your needs. 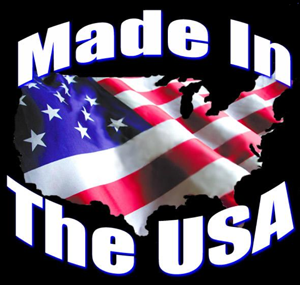 Most importantly, MADE IN THE USA, shop now for the perfect fit. Getting Ready For The Holiday….Outdoor Style!! …that seemed to end all too soon? You probably spent a lot of time on your outdoor patio, soaking in the sun, dining outside and enjoying the breeze. Just because the weather is getting cooler, there is no reason to neglect your outdoor patio. While it may be too chilly some nights to enjoy dinner alfresco, you can still take advantage of the cooler weather to make your patio something to be proud of. Why let your relatives have all of the fun of hosting? Don’t be ashamed of your old patio and backyard any more by sprucing it up this holiday season. New patio furniture is the first step in making your outdoor living space the ideal entertaining area this holiday season. First we recommend the following steps to ensure when your new furniture arrives, you are all but ready to start the party. Sweep out the corners and hose the whole thing down on a warm day. If dirt and grit has accumulated between the pavers, scrub it out with a stiff brush. Throw away old plants and put away the decorations for which the season has already passed. No excuses; if you don’t do it now, you’ll still be looking at your old mess months from now when spring breezes tempt you outdoors again. …it’s time to purchase or unpack your new patio furniture, making your outdoor space look spectacular for your guests arrival. Cast aluminum or wicker furniture are your best options for good year round, durable outdoor seating. These days, there is no such thing as having to keep everything uniform. 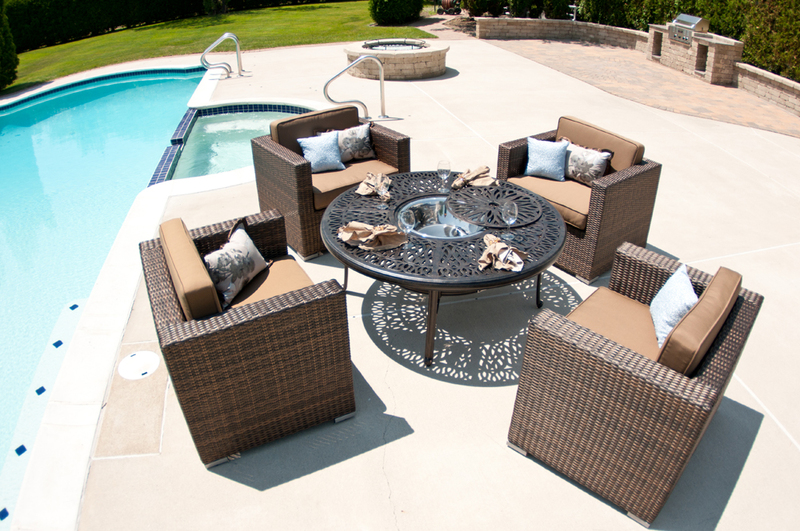 Mix and match wicker with cast to have the best of both worlds. Open Air Lifestyles, LLC has a virtual catalog of these configurations, bringing this style to the forefront. Once your furniture is in place, here are a few more ideas to make your outdoor space festive for your upcoming gathering. Hang twinkling white lights across the ceiling to add a touch of holiday magic once the sun goes down. Purchase or re-purpose a large planter and plant an evergreen tree. Decorate it with stringed popcorn and cranberries to provide a feast for the local birds and to give yourself and your guests an up-close bird-watching experience. Don’t be afraid to incorporate your family’s religious or cultural holiday symbols on your patio. For example, place a menorah on a small glass table, or assemble a creche on small platform. When the temperature heats up inside due to your roaring fire coupled with many guests, some family members will likely spill out into the patio, even if the air is crisp and cool. 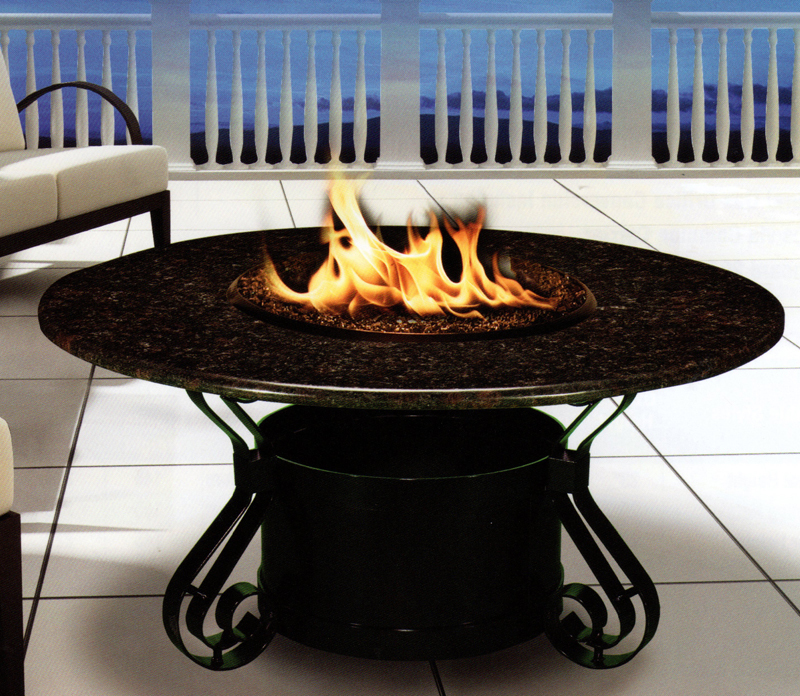 A fire pit is the perfect thing to add to your patio if you are remodeling. Picture your guests snuggled together in the soft glow of the flame, roasting marshmallows or simply enjoying the romantic atmosphere. Sprucing up your patio for the holiday season is a an oft-forgotten part of seasonal decorating, but so important. As the holidays approach, but before it gets too cold, look at your patio from every angle, and consider what you may need to do to keep it in good physical repair. Let Open Air Lifestyles, LLC add that extra special something to your outdoor entertainment space, from luxury patio furniture, to some of the most high end outdoor fire pits in the industry, we can take your holiday gathering from ordinary to extraordinary with a few simple additions. Pleas do not hesitate to call us at 1-877-548-5697 and let one of our outdoor specialists find the perfect fit for your outdoor living space, ensuring your holiday event will be one that will be talked about for years to come. Furniture is essential for any resort. Owners want to purchase furniture that reflects their resort and provides comfort and confidence in the resort. Purchasing quality commercial patio furniture does not have to be expensive. There are many ways to stick to a budget and get everything you want for you and your guests. Open Air Lifestyles, LLC has done a recent expansion to our commercial patio furniture offerings. We have always done wicker, cast and sling commercial patio furniture in the past, but now we are introducing custom sling and strap lines, to fit any and all commercial applications. Here are a few buyers tips to make your commercial furniture purchase cost effective. Buy in bulk. Buying commercial patio furniture in bulk is a great way to save money and receive discounts. Open Air Lifestyles, LLC commercial patio furniture offers great discounts for large quantities. The more patio furniture you buy the better price we can offer you. We offer many different types of commercial patio furniture for hotels, clubs and resorts. The type purchased can depend on many factors. Owners typically want to purchase furniture that is low maintenance and elegant as well. There are several types of commercial patio furniture that meet these criteria. Aluminum strap patio furniture and aluminum sling patio furniture are two great choices that will fit any budget and are extremely low maintenance. They are also very pleasing to the eye. 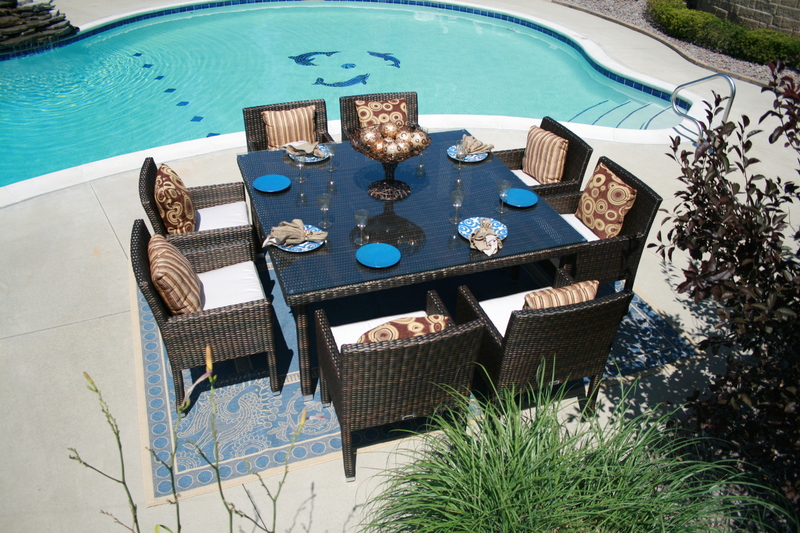 Resin patio furniture is another great, low maintenance choice for resort owners. Open Air’s resin patio furniture is stain, scratch, burn, and fade resistant. It is easily washed with just soap and water. We can custom design and manufacture any resin furniture, dependent on your requirements. We also suggest, Sunbrella brand fabric for all of our commercial resin, this will ensure years of durability and stain resistance. When purchasing commercial patio furniture, it is important to order the right amount. Order enough so there is furniture for all outdoor setting, plus a few more for seating extra guests or for damage. Do not order too much furniture just to receive a discount. Storing lots of extra furniture can be a burden for resorts with little extra space. Purchasing resort furniture is an important task that should be carefully planed and executed. Planning will save resort owners lots of time, money, and headache in the long run. It will also provide the best patio furniture for the money, and for the guest’s enjoyment during their stay. Please call us for your custom commercial furniture quotation, and see why Open Air Lifestyles, LLC can design and create a commercial patio space for you and your customers to enjoy for many season. 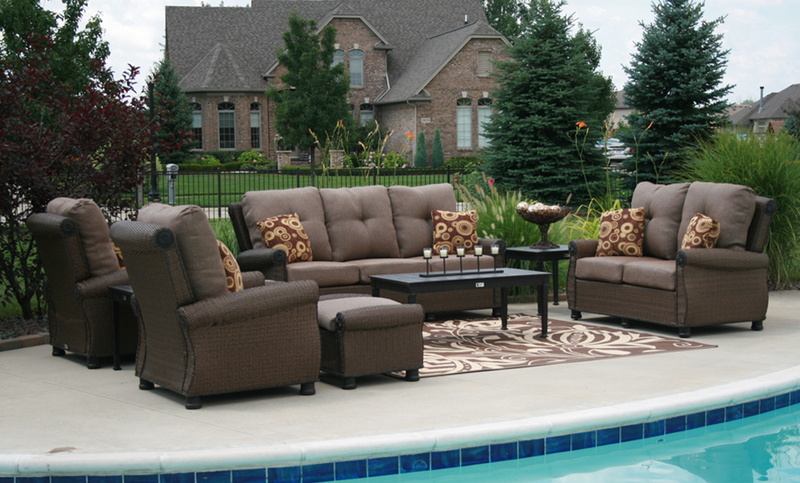 What are some of the key characteristics for that perfect outdoor set? 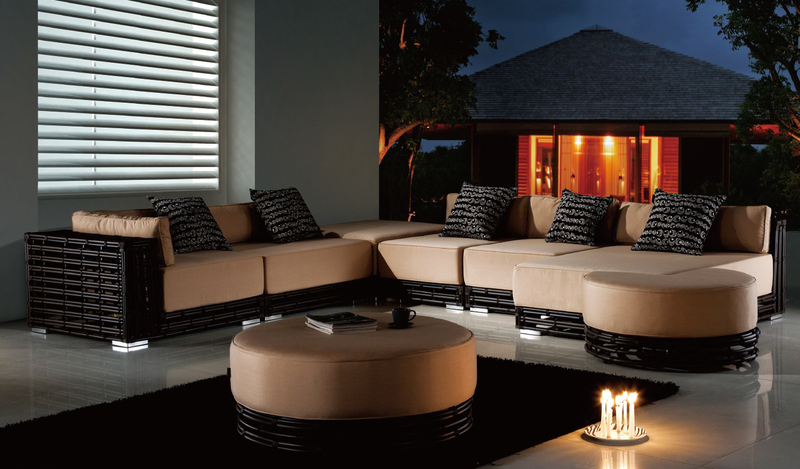 Your outdoor retreat should be a reflection of your distinct personality and impeccable taste. With our contemporary outdoor furniture line, you can tie together the look and feel of sophistication that is evident throughout the rest of your home by carrying it on to the outdoors. Most homeowners take great pride in the atmosphere they create in the interior of their homes. With our stylish and contemporary outdoor furniture you won’t have to settle for cookie cutter designs that clearly lack individuality. Our classic, contemporary outdoor furniture will create an exquisite and inviting setting, perfect for the most sophisticated dinner party and yet comfortable and relaxed enough for a weekend poolside barbeque. Made from colorfast materials, our wicker furniture is Viro brand and will resistant fading. It won’t become weathered looking or drab even after years of sun, snow, and rain. Created from a non-porous material, so our synthetic wicker furniture will not hold mold or absorb oily substances, such as tanning products. Won’t be damaged by ordinary pool chemicals or saltwater. Created from the most durable type of synthetic wicker weave, 2 by 1, which will not rip or tear like traditional outdoor wicker furniture. Is made to commercial grade specifications with a double reinforced frame for the ultimate in durability. 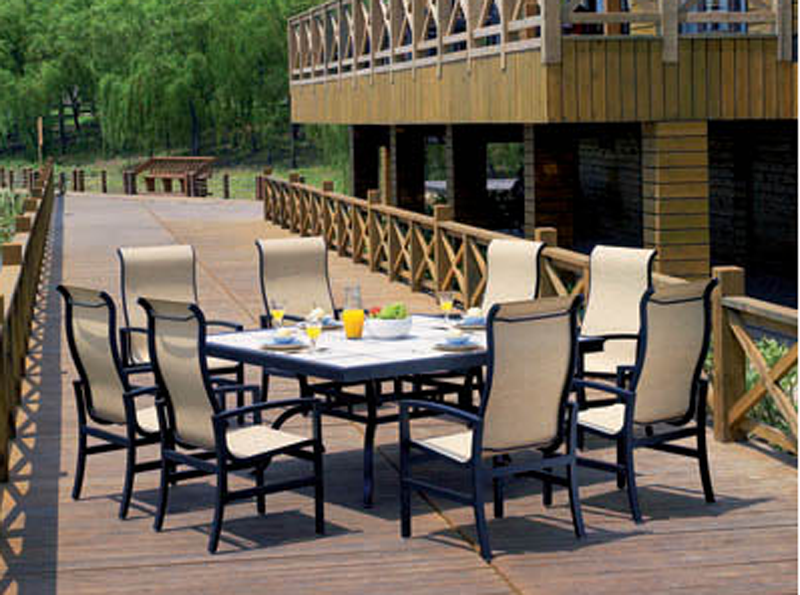 Because our outdoor wicker furniture is commercial grade, it is able to withstand high traffic areas and years of use. Weight resistant, up to 350 pounds without becoming deformed or damaged. At Open Air Lifestyles, LLC, we realize that every one of our customers is unique. Not everyone has the same vision for a particular room, patio area, balcony, or veranda. Our contemporary outdoor furniture features clean, straight lines that is easy to blend with any other accent pieces or furniture. Seating Solutions – Our Pomellato Collection is an outdoor sectional seating solution that makes a bold statement of luxury and style. Highly adaptable to any amount of space or even the most difficult layout, our indoor / outdoor sectional is a masterpiece in outdoor seating. Dining Solutions – Our Via Collection is both functional and fashionable. Dine in absolute elegance with all weather contemporary wicker furniture that is certain to impress your dinner party guests. 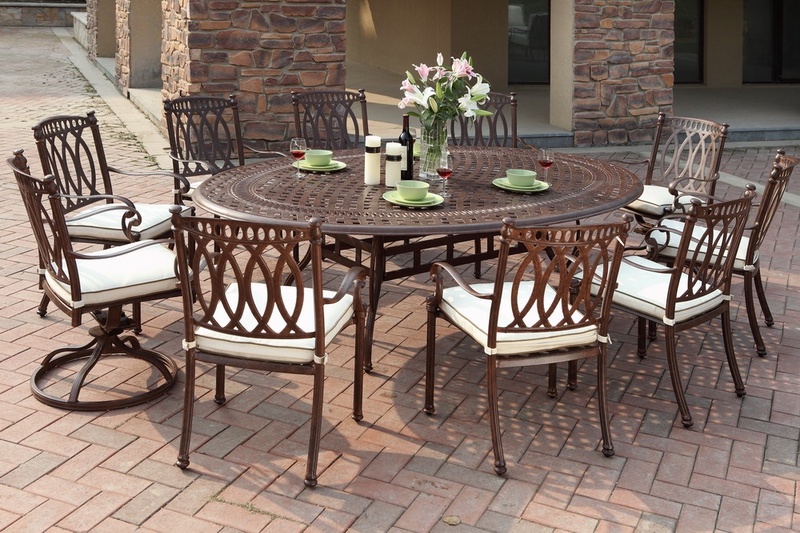 Perfect for the patio, balcony, or garden, this durable and finely crafted dining set will stand the test of time providing comfortable outdoor dining for years to come. Lounging Solutions – There’s nothing that quite compares to the peace and tranquility of an outdoor chaise lounge area. Whether you are creating your relaxing sanctuary next to the pool or nestled amongst the roses and fountains of your flower garden, our contemporary outdoor furniture is the ideal selection. Our chaise lounges and wicker daybedsare offered in a Viro Prussian Dark Bronze wicker and premium quality Sunbrella Fabric cushions are created for the ultimate in comfort, while also the convenience of stain resistant, quick drying material. Isn’t it about time you experienced the true luxury, durability, and quality of our beautifully crafted contemporary outdoor patio furniture? At Open Air Lifestyles. LLC, we pride ourselves on excellence, always providing the best customer service and a satisfaction guarantee that goes above and beyond our competition. Call us today. You’ll be glad you did. Following the successful implementation of the LinkedIn API, luxury patio furniture manufacturer Open Air Lifestyles, LLC has introduced ‘Quick Response’ codes in its online and paper mailing adverstising. Created by a Toyota subsidiary in 1994, the QR code is a specific matrix barcode readable by higher-end mobile phones with cameras. The code consists of black modules arranged in a square pattern on a white background. 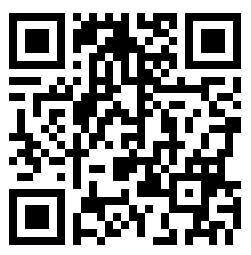 Once a photo of the barcode has been taken using a smartphone, the user is taken directly to the Open Air Lifestyles, LLC website. Open Air Lifestyles, LLC operations manager Alex Betten explained: “The increase in mobile phone traffic to our site made the implementation of QR codes in our product adverts a natural development. Mr. Betten emphasized that given the company’s growth in 2011 and the increased traffic to its website, the implementation of QR codes will create further accessibility to commercial and residential sales opportunities for years to come. We like to be on the cutting edge of technology, not only in our outdoor patio furniture design but in how we present our Collections to our customers, making a very-experience. This will be defined by understanding what the outdoor room will be used for and then deciding on what the must-have and the nice-to-have items are. The beauty of this, is that you can collect these pieces that are necessary to start then add at your convenience, until you have everything you have ever dreamed of for your ideal outdoor room. It is essential that your outdoor room complements your home – it should accentuate your home’s indoor and outdoor spaces. As such you should have a clear understanding of your home’s architectural and decor style when designing your outdoor room, and choose the products accordingly. These two elements are key to a successful outdoor room – the fireplace and lounging area should stand as focal features, the cooking and eating areas should blend in as secondary design elements, and then thereafter, all the other accessories and features. Selecting the right furniture is paramount to the success of your outdoor room, as it will define your levels of comfort while you are enjoying it. Regardless of style, the aim of outdoor furniture is to add beauty and character, as well as improving the overall experience of the area. In addition to the standard tables and chairs, also consider adding chaise lounges, couches, side tables, coffee tables and oversized scatter cushions. There are so many options to help make your indoor/outdoor space look stylish. However, the big question is can we have all achieve that gorgeous ‘magazine’ styling whilst still using durable, easy-to-care-for items that will stay looking good for many years to come or will it fade/weather and look worn out after a single summer? When it comes to materials, now more than ever the gap has been bridged between cheap and quality materials for the outdoors. High end resin wicker furniture today the two best brands are Viro and Rehau. In a cast aluminum patio furniture set, make sure the manufacturer is using good quality aluminum and not what we in the industry call “remelt.” How will I know the difference you may ask? Here are a few good clues to help you identify quality furniture from cheap stuff. 1. Remelt furniture will have impurities in the aluminum, thus the casting is not smooth and you will see air holes or pits in the aluminum furniture. 2. The tencil strength of the furniture is very low, giving you less durability. So if your chair or table breaks easily after a short amount of time, this could be your answer. Many people in the US are beginning to find that perfect outdoor patio furniture and outdoor fabrics have come a long way since the plastic-coated vinyl of the 1970’s. Companies such as Sunbrella and many other high-end outdoor fabric manufacturers are being praised for their wide selection of colours, styles and textures. Really good outdoor fabrics don’t come cheap mind you, so if that set your buying seems like the “best deal ever”, you may be getting imitation Sunbrella fabric. It doesn’t matter what type of outdoor furniture your looking at, resin wicker, cast aluminum, teak or aluminum sling, ask the good questions about the materials, the warranty the manufacturer provides (including the fine print) and the little simple questions that will ensure that your outdoor investment is a long term good one. Open Air Lifestyles, LLC can help answer any of the questions you may have. 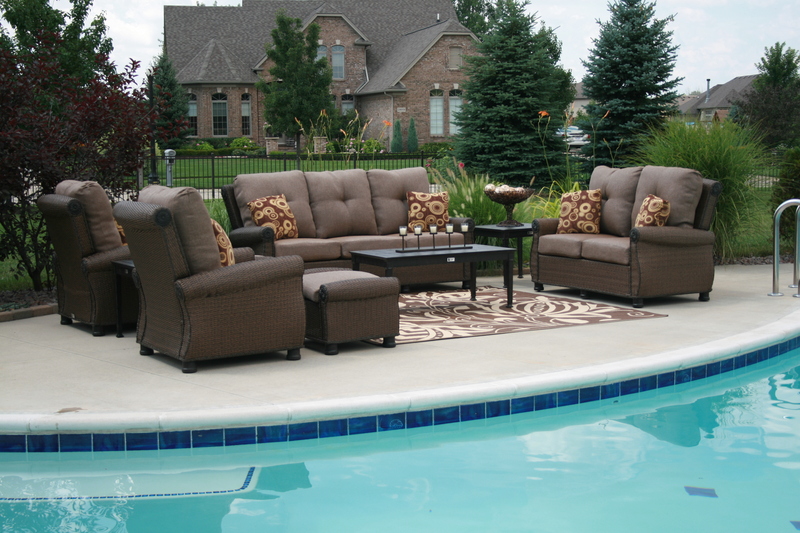 We can offer suggestions to make sure that you are receiving the style and comfort you are requiring, and that it will be outdoor furniture you will have for years to come. If you don’t see anything you like in our current inventory, we are proud to offer custom outdoor furniture designs and ability to fit every and all your requirements.